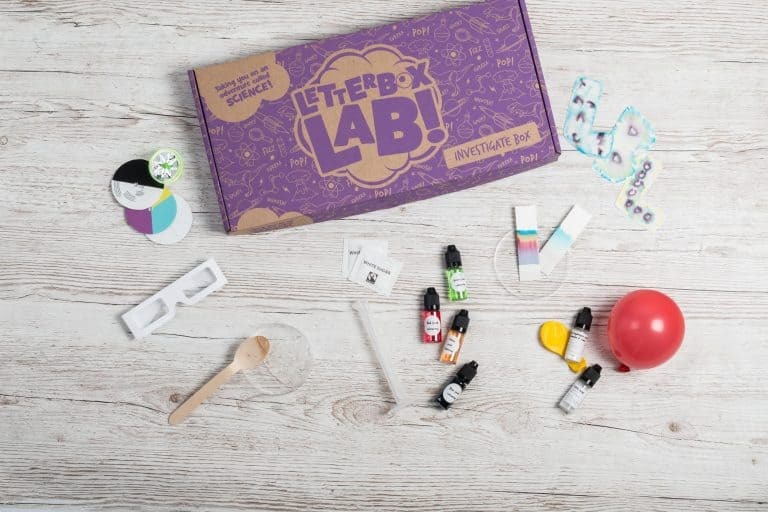 Letterbox Lab provide innovative children’s science kits as subscription boxes. 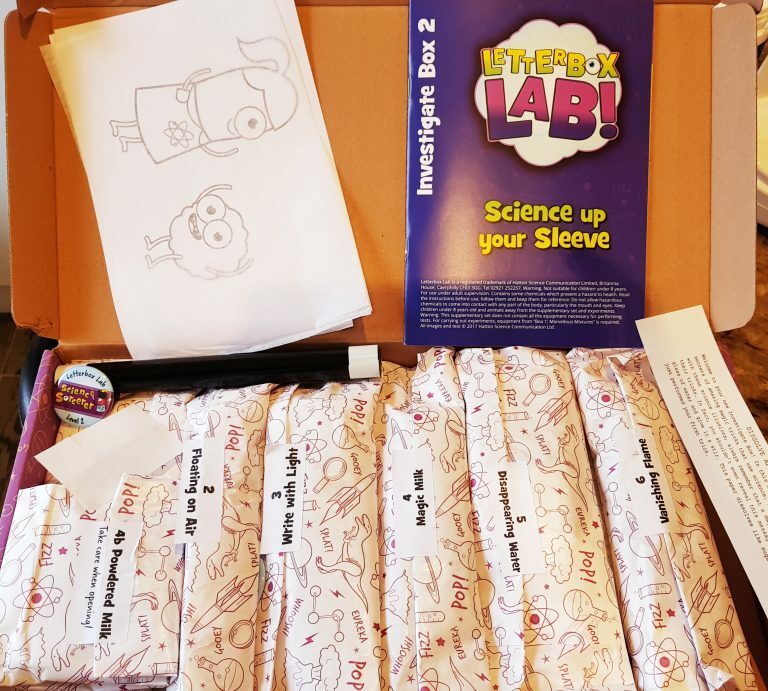 The Explore Box (£8 + £2 postage) is for kids aged 6+ and contains a least an hour’s worth of fun science. The Investigate Box (£22 + £2 postage) has more experiments and more items of collectible lab equipment with enough to keep a junior scientist busy for 3 or 4 hours.Both kits have full-colour illustrated instructions and online videos to make it easy to do all the experiments. My daughter has turned eight, and is trying out the Investigate Box. The box is bigger than the Explore box, but it still fits through the letterbox. 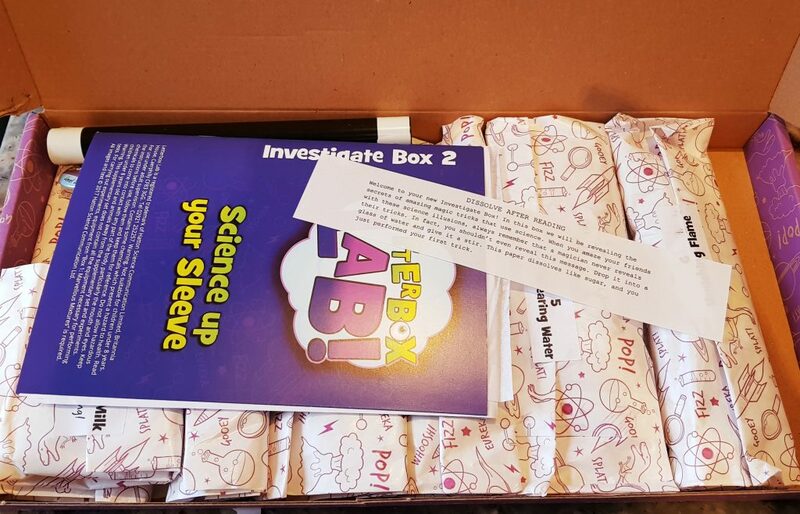 There are eight experiments in this box! 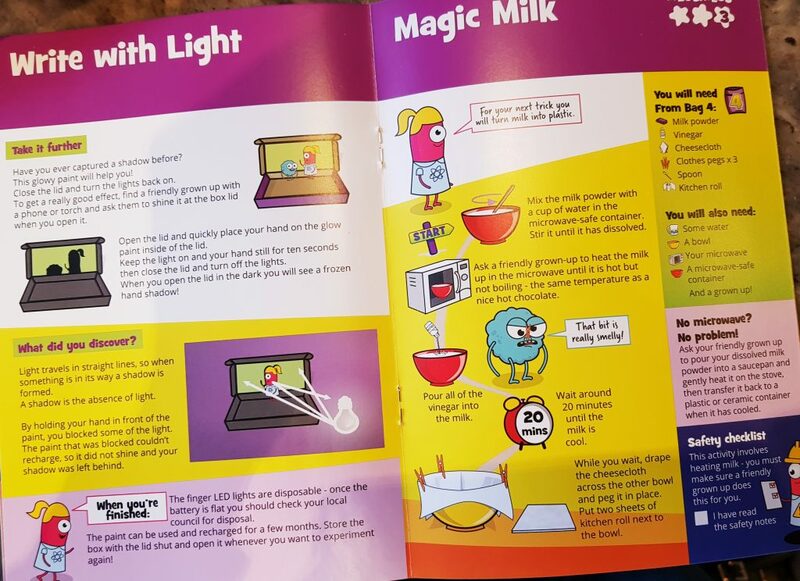 The theme is using science to make magic tricks. 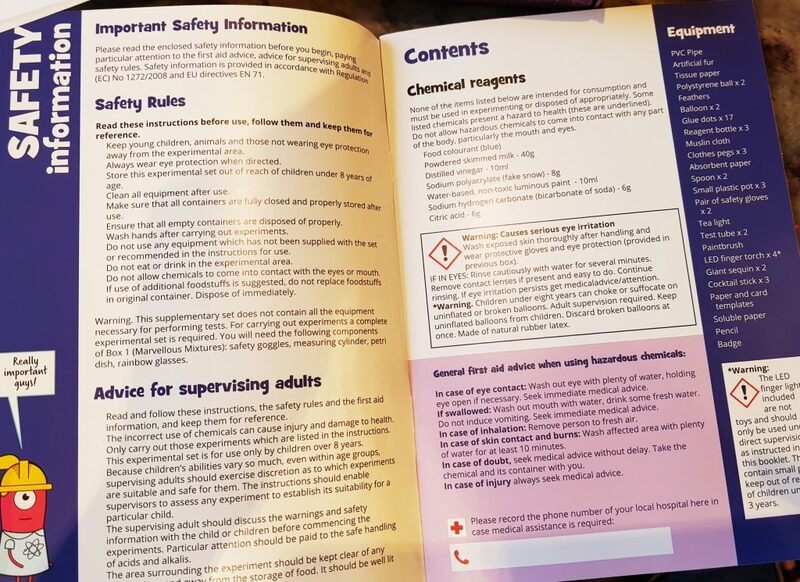 The booklet has lots of advice and guidance, including proper supervision. 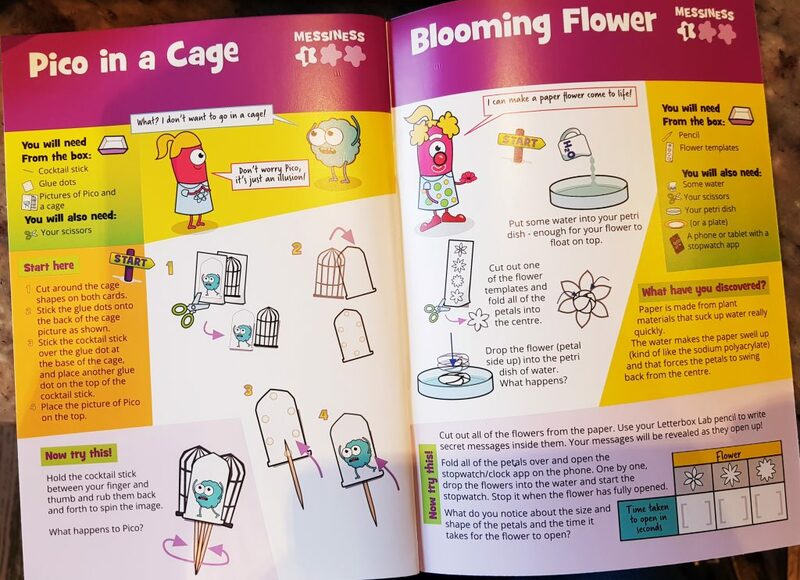 The instructions for kids are very clear, and have lots of fun illustrations. there are two little characters that guide you through the experiments themselves. The first experiment, Magic Wand, uses a balloon, fake fur, and a plastic pipe to create different effects with static electricity. 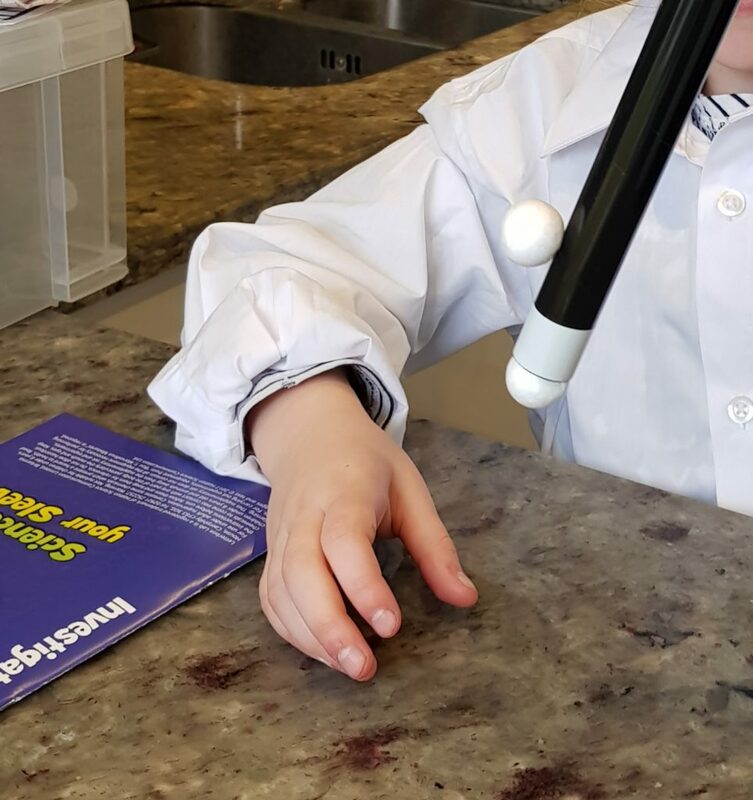 You can make polystyrene balls stick to the wand! Floating On Air was tricky to get the hang of! 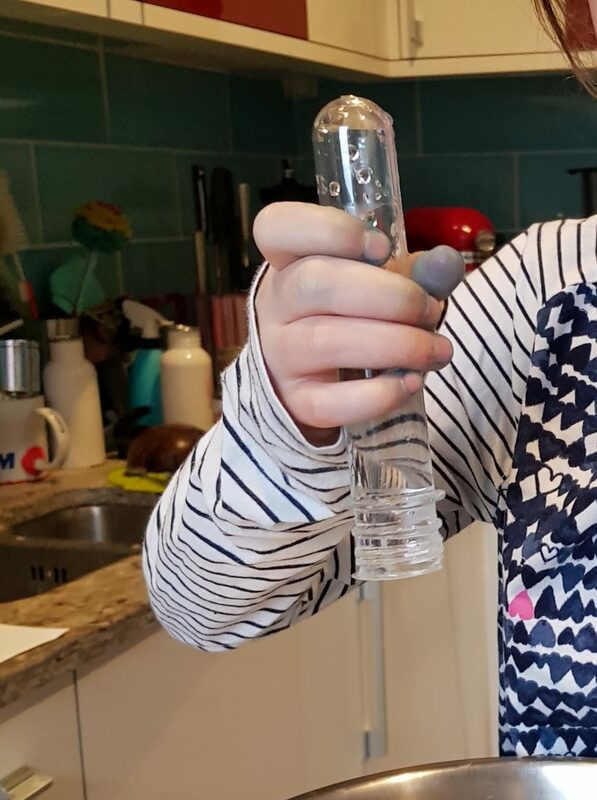 You filled a test tube with water, covered it with a large sequin, then turned it upside down to see if the water would come out. This experiment was about air pressure. We did actually manage to do this eventually! 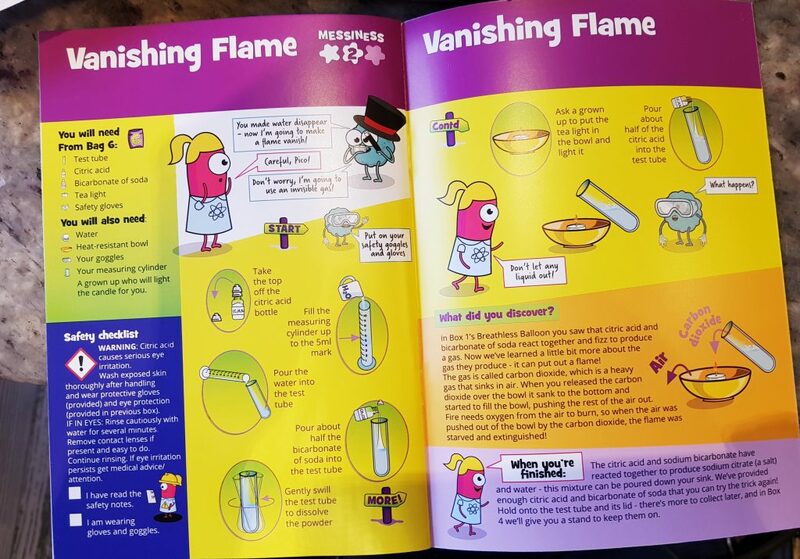 Vanishing Flame was an active experiment, and demonstrated how carbon dioxide would put out a flame. It was an incredibly cool effect! These two experiments were about optical illusion and something moving of its own accord. In Magic Milk we made a dough-like substance with milk and vinegar which could be moulded and dried, though it only lasted a few days. 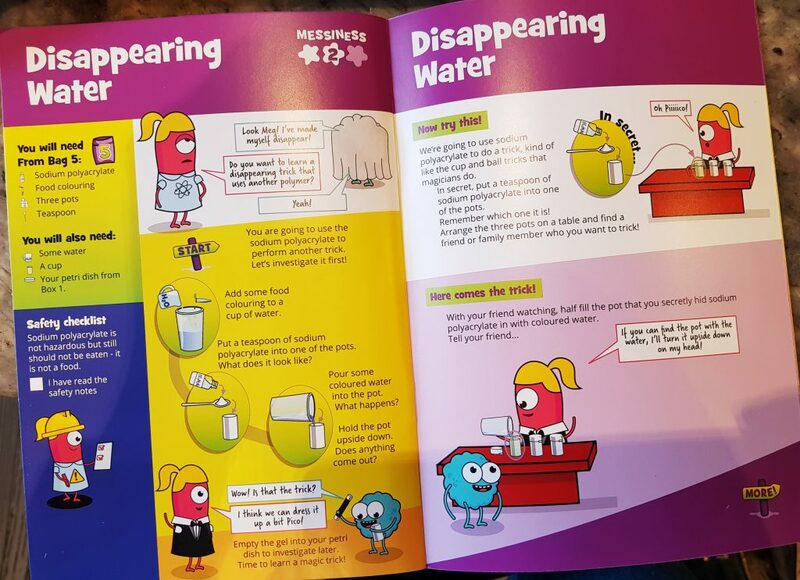 Disappearing Water was a really impressive experiment! It used sodium polyacrylate to create the illusion of water disappearing when it was poured into a pot. 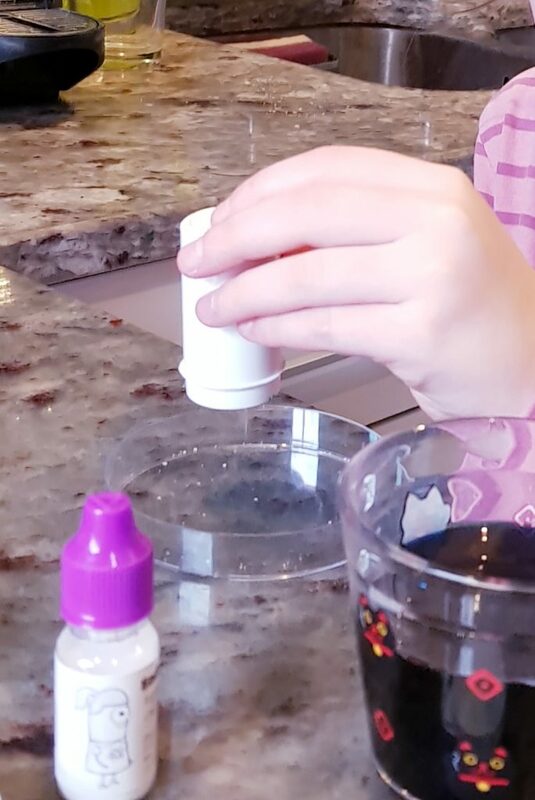 The sodium polyacrylate soaked up the water so you could tun the pot upside down and nothing would come out! 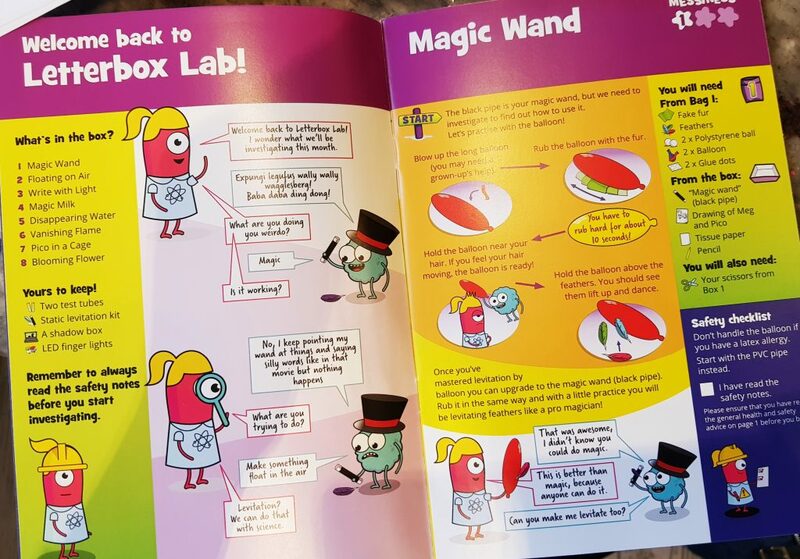 It even showed you how you could use three pots to turn it into a proper magic trick. 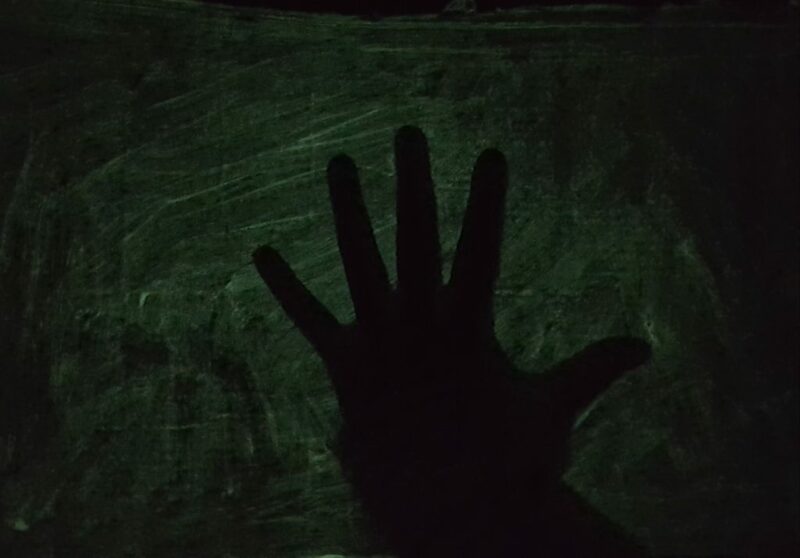 Finally, Write With Light used luminous paint to demonstrate how light travels and how shadows block it. The inside of the box lid was painted with glow paint, which would be the basis for the experiment. 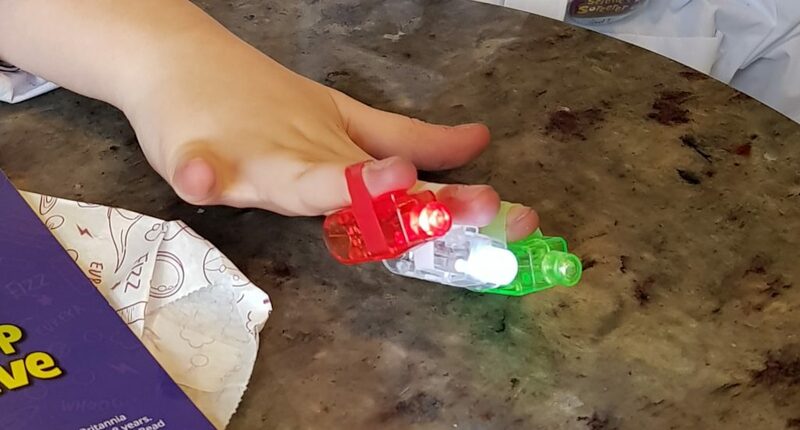 The were little finger lights included in the box, and these could be used to write with. We experimented with the different colours to see if they would make a difference to how the paint reacted. You could also use something to block the light and create shadows in the glowing paint. This is what it looked like with a hand shadow! 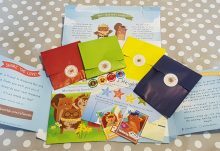 It’s a fantastic effect, and you can use all kinds of different shapes. The Investigate Box is a great step up from the Explore Box. The experiments take longer, plus there’s much more to do, and you definitely need to have more patience! The effects themselves are really good. There’s also enough ‘real’ chemicals to make this feel much more advanced for kids, plus you also get extra equipment. This month was test tubes to keep, plus the finger lights. All the equipment will build into a very nice collection, which includes the safety goggles from the last box, and will be added to every month. The instructions themselves are excellent, with great illustrations. 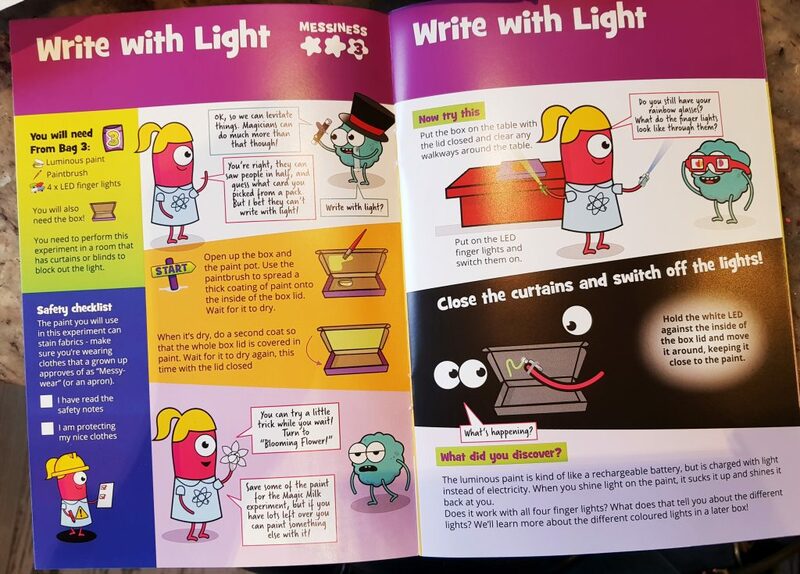 The explanations of the actual science are very clear, and should fit in well with school science study. 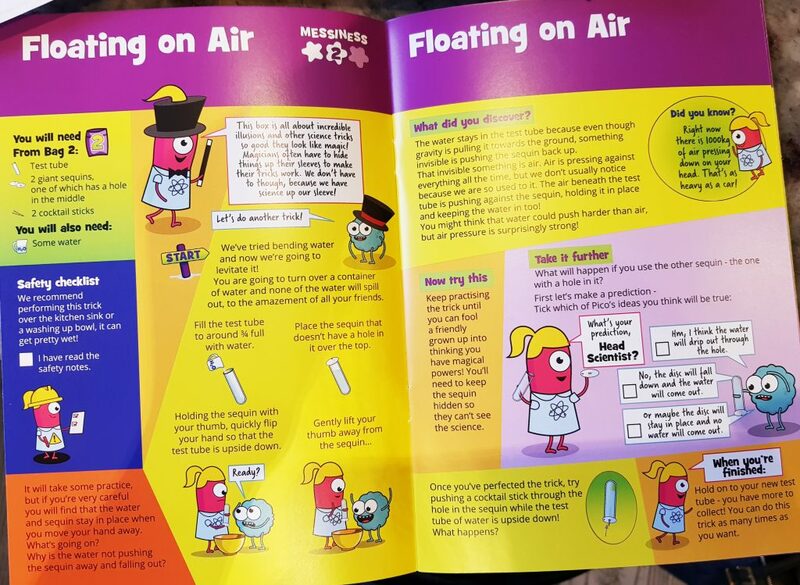 The booklets ask questions so kids have to think about what they’re actually doing and what might happen in the experiments. 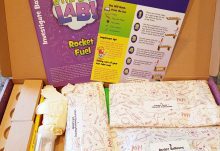 This is a wonderful box to allow children to have fun with science while learning things that will definitely be useful in their future education! 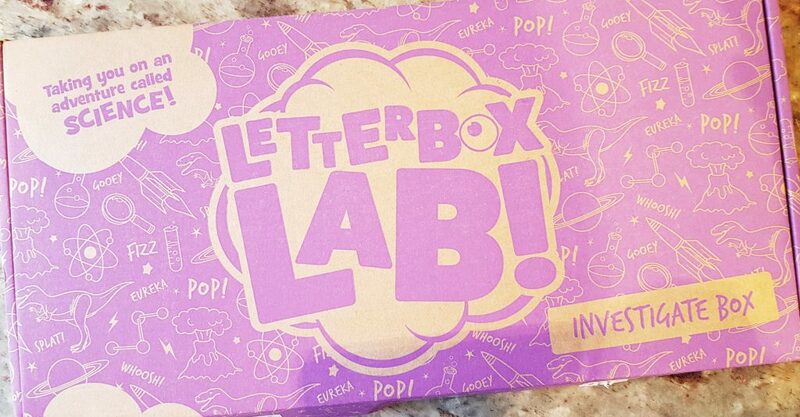 How would you rate Letterbox Lab ? Rating: 4.1/5. From 7 votes. 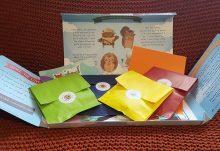 Weekend Box – April 2019: Excellent Easter fun! Freedom Japanese Market – May Box Spoiler and Discount Code!